Ask Chrissie: Is it worth recovering my old sofa? Is it worth re-covering my old sofa, chair or lounge suite? Chrissie shares her reupholstery advice and tips on choosing an upholsterer. Q. Is it worth recovering my old sofa, chair or lounge suite? If it’s a piece you were given or have found, it looks sound and you’re happy to invest a little more in having it look brand new again. It’s a cheap import (regularly sold online) many of which can’t be re-covered or cost more to re-cover than what you originally paid for it. When buying furniture, check the durability of the fabric it’s covered in. Can it withstand the rigours of kids and pets or is it susceptible to fading in a room that gets a lot of sun? If it is an investment piece, can you re-cover it in 5-10 years time? Remember that leather is essentially a “skin” and should be treated as such. Leather requires care and nourishment and with regular maintenance can last a lifetime. In a world where so much is disposable, it’s often nice to know you’re not contributing to landfill. 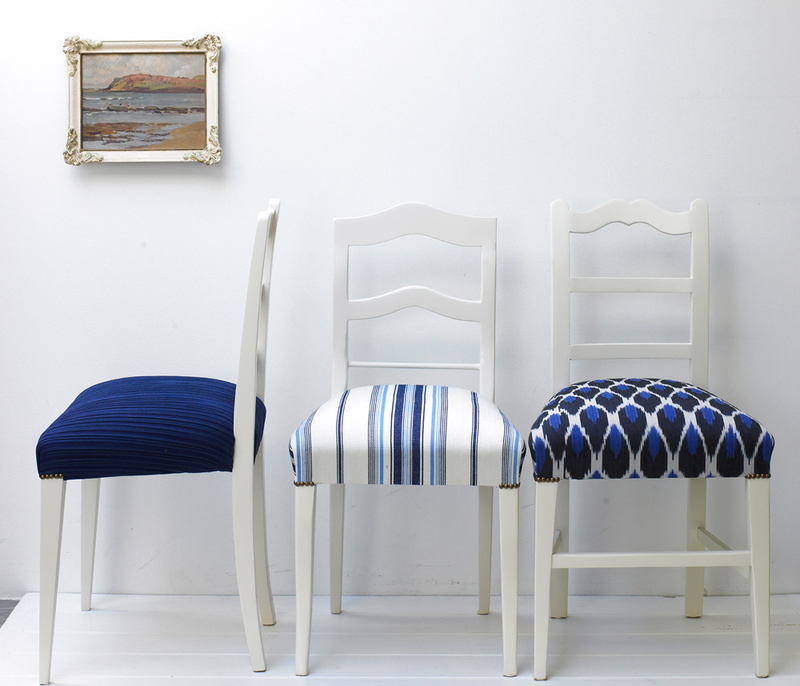 Dining chairs re-upholstered using textured, striped and Ikat fabrics. Q: Is it worth re-covering my sofa, chair or lounge suite if it’s unfashionable and daggy? A. We’ve helped many of our clients transform their dated lounge suite or chair from drab to fab! 1. Thick over-padded sofas can be made more streamlined. Arms can be made narrower – have a conversation with your upholsterer about what he recommends. replaced with more modern square ones. 3. Change from three seat cushions to only two. 4. Have a single, long seat cushion with large scatter cushions for the back. 5. Replace braid with metal studs on timber chairs. 6. 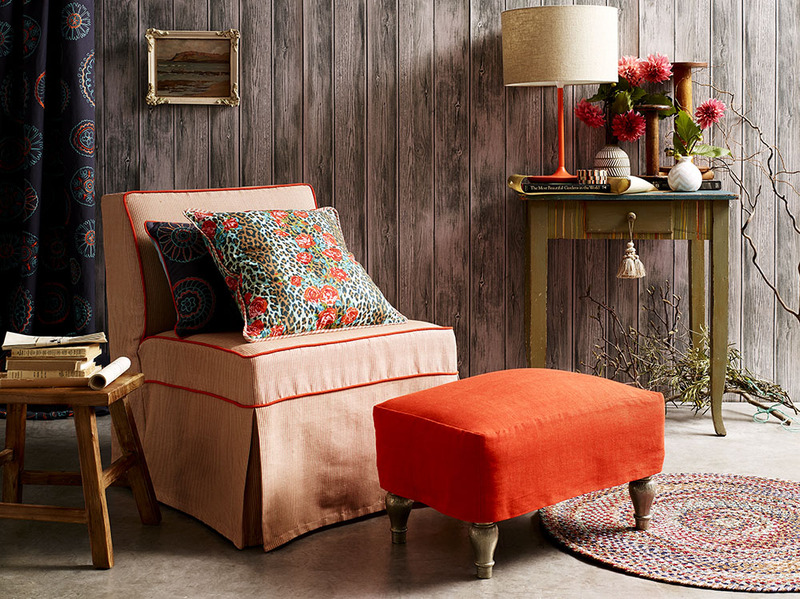 Upholster an antique chair with a contemporary Ikat rather than a traditional velvet. Chair slipcovered using “Bombo Stripe” col Flame and ottoman slipcovered using “Ruff” col Cumquat. Q. How do I know which fabric to choose? 1. Furniture used everyday i.e the family room sofa, should be covered in a medium to heavyweight fabric. Technically speaking, a fabric with a rub count of 20,000 or more. If you eat on the sofa, choose a synthetic fabric that is easy to steam clean. If it’s likely to come in contact with sticky fingers or pets, a professional clean once a year is advisable. 2. In some households, the family pet likes a spot on sofa as much as the next family member. Think about having a pet blanket made in the same fabric as the sofa to protect the seats from your four legged friends. 3. Other than the usual wear and tear, fabrics worst enemy is the sun. 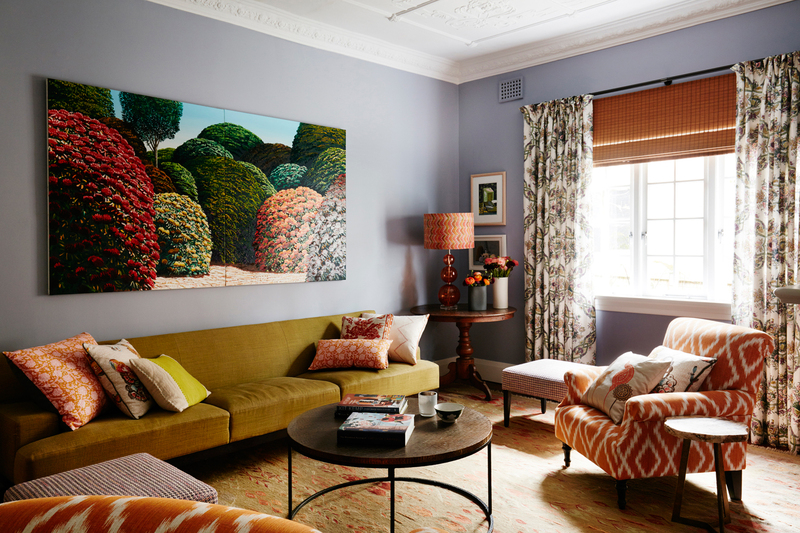 In large sunny rooms, pick lighter colours with a partly synthetic composition. The sun will fade most dark colours and synthetic fibres tend to be less susceptible to fading. 4. Cottons and linens are good for slipcovers. Make sure the fabric has been pre-shrunk before having them made. Consider having extra seat and back cushion covers and arm caps done at the same time. Slipcovers are practical if you want a white sofa. The covers are easily removed for dry cleaning. There’s a world of fabrics available to you and we’re happy to discuss what will suit your look and lifestyle. Q. My upholsterer has suggested I cover everything in the same fabric, what should I do? A. We get asked this a lot by client’s who are looking for fabrics outside of what their upholsterer is offering. 1. A good upholsterer is a tradesman not a designer. In our experience, the more expensive they are, the better the quality of their work. A cheap upholsterer will want the job to be quick and easy with no changes to the style of the furniture and only using a plain fabric. 2. Upholsterer’s rarely keep up with the latest trends but those based in and around the city will be aware of what’s going on. If you deal with an upholsterer direct, make sure you’re very clear about what you want, pictures are helpful and if you’re providing your own fabric/s, be sure to put in writing which fabrics are for which piece with a sample of the fabric/s attached. 3. 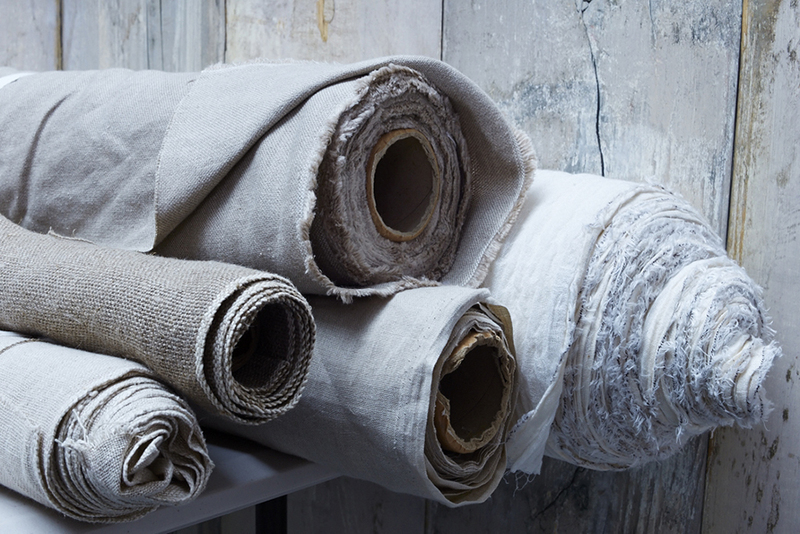 Most upholsterers will have a small selection of fabric samples to choose from. They are generally plain, inexpensive fabrics which are given by fabric companies free of charge. Don’t expect to find designer fabric books, they are quite expensive and often upholsterer’s won’t pay the cost. 4. If you have an antique or high end piece of furniture, choose an upholsterer who has had experience with this. There’s nothing worse than having a beautiful piece badly upholstered or worse, ruined by shoddy workmanship. Sofa, chairs and footstools upholstered in complimentary fabrics. We deal directly with a handful of good upholsterers and very rarely question their cost, fabric quantities or recommendations. However, we specify the fabric design and colour and never leave this up to them to decide. At No Chintz we can help you choose the right fabric, offer advice on restyling your furniture, provide a quote and organise the collection and delivery of your furniture. We’ve been doing this for over 25 years!